Election debates can be exciting spectacles — they’re fun to watch, and they are important reminders of the value of democracy and constructive disagreement. They are not, however, the best format for political leaders to cite their sources or explain nuance and in the rapid back-and-forth some detail is lost. So we thought we’d dig into three statements from last night’s Ontario Leaders’ debate with the goal of both fact-checking the political statements and providing the policy detail behind the debate. On page 295 of the 2014 Ontario Budget the government said it would move forward with a “mandatory pension plan” that “builds on the strength of the Canada Pension Plan”; and the next bullet point says it would introduce a “legislative framework for pooled registered pension plans”. It’s fair to say that Pooled Registered Pension Plans (PRPPs) are “Harper-style private pension plans”; since they were proposed by the federal government after it decided not to expand the CPP. As outlined in the recent CCPA report by Hugh Mackenzie, Risky Business: Canada’s Retirement Income System, PRPPs are “really a system of RRSPs by another name and managed by a different set of financial institutions.” They’d have the risk and administrative costs associated with market funds and none of the security associated with defined-benefit pension plans. What does the fine print say? As outlined on pages 310-11 of the Budget and as Wynne attempted to clarify during the debate, unlike the federal government’s plan to just allow PRPPs, her party is actually proposing both the mandatory Ontario Retirement Pension Plan and PRPPs. Is Ontario on the verge of bankruptcy? Hudak seemed to suggest it is and went so far as to compare Ontario to Detroit, California or Greece. The comparison isn’t very accurate. Greece’s net debt-to-GDP is over 160%. Ontario’s is 37.4%, a level that Greece hasn’t been for three decades. California’s ratio is lower than Ontario’s – as claimed by a recent Fraser Institute report – but it is a flawed, false comparison, since U.S. subnational jurisdictions have a far lower capacity to raise revenue and have a different set of responsibilities. 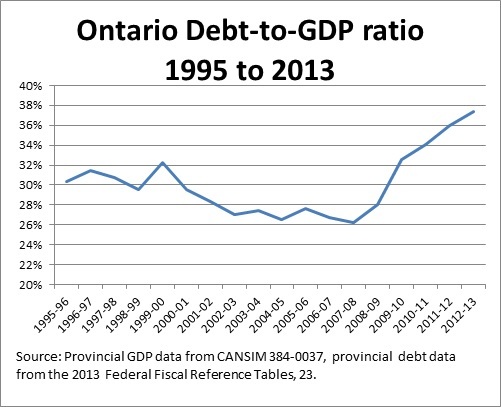 Here is Ontario’s debt-to-GDP ratio since the beginning of the Harris government almost 20 years ago. You’ll note that Ontario’s current “debt crisis” is only 5.1 percentage points higher than the peak in 1999-2000 under the previous Progressive Conservative government. The more pressing issue is the province’s fiscal deficit, which all parties plan to eliminate within a few years, but it would be false to suggest that it needs to be dealt with abruptly and at the risk of an economic shock. Reality check: the sky is actually not falling over Ontario’s debt levels. Tim Hudak describes his plan to fire 100,000 public servants as a minor reduction of less than 10% of Ontario’s “payroll”. But that number is dubious at best. In order to get anything close to the number Hudak cites as the payroll of Ontario public servants, you need to include the 144,000 workers in the postsecondary education sector and the 326,000 workers at the municipal level (including municipal enterprises like transit workers and local utilities). Although the province has jurisdiction over municipalities and universities, in practice they have a great deal of autonomy and separate payrolls. When you dig into the plan to cut public servants, it’s clear that it wouldn’t be minor. As CCPA Ontario pointed out in a Toronto Star op-ed, the cuts would have a negative spin-off effect on the Ontario economy.
? Who’s right on Ontario’s Labour Market – Wynne or Hudak? A degree is the new high school diploma: But who can afford it? Are Higher Minimum Wages Un-Canadian?